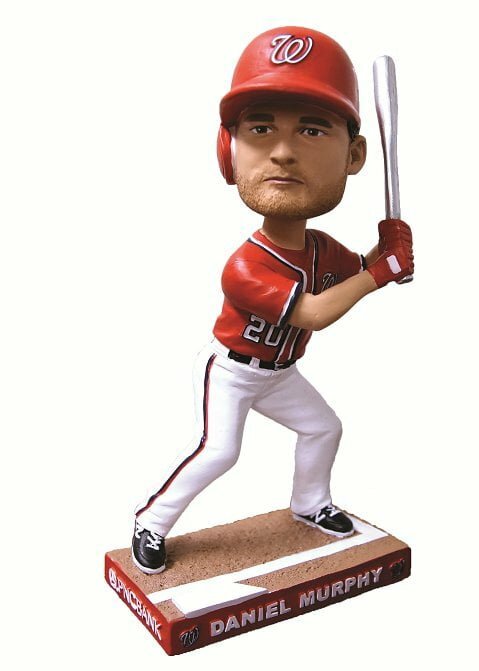 It's Daniel Murphy Bobblehead day in Washington later this afternoon as the Phillies take on the Washington Nationals at Nationals Stadium at 4:05 PM. Murphy has seemed to only get better with now his second season away from the NY Mets, a team that up till 2015, he had spent his whole career with. Murph was with the Mets for 7 seasons, and last year was a metamorphosis for him as he finished 2nd in MVP voting and earned a Silver Slugger award and was named an All-Star in the first year of his Nationals career. Murphy is off to another hot start with the Nationals, he's batting .450 and already has 9 RBI on the season along with 18 hits. The Phillies bring a 3-6 record into the game, they've been playing very inconsistently so far with bad pitching and not a whole lot of offense. If we take away that Phillies 17-3 win over the Nats on April 8th, there wouldn't be a whole lot of offense that has been produced by this team. It's Aaron Nola vs. Stephen Strasburg today as probable in today's game.